Photo Books and Photo Albums With the easy digital photo album software, you can have a professional photo book printed and bound with either soft or hard cover options. Relive your digital photos, make a beautiful photograghy book or a simple family photo album! You have the option to use auto-design feature to get a book done within 30 minutes, or you can create a masterpiece your own way! (from a digital photo album to a book in no time) Family Memories makes your book making journey fun and memoriable! Select from hundreds of background designs, templates, and design elements, add your photos and captions, the possiblity of your photo album is endless. Once you have the book created, just click the Publish button to create the file and upload it to your account. You can then preview the book once it is uploaded to our server and go ahead select correct order options to place the order. Within a week or so, you will receive the beautiful photo book that will bring back your memories for the lifetime. Full color custom design with your own photos and captions. Additional page for over 30 pages: $0.75/page. Available in 5 different colors: Black, Grey, Red, Khaki, and Cream. Title page features one photo and one line of text only. This title page will be bound to the back of the front cover. The photo and the text line will be displayed through the die cut window. Die cut window on front cover, full custom color dust jacket that includes (from left to right): back cover flap, back cover, spine, front cover and front cover flap. Available in 2 different colors: Black and Brown. Over 100 layout templates available. Either white or select from hundreds of photo album page backgrounds. Decorate your pages with different types of embellishments, such as buttons, corners, shapes, and borders, etc. Your book, your way! Design the photo album your own way with the full flexibility design features. High quality 100# gloss paper. Base price is for a 30-page color book. Personalized Photo Cards A personalized photo card is the best representation to show how special your family and friends mean to you. With our card background selections, you can add your photo, type the greeting words to make a customized photo card in just minutes. Instead of sending a store-bought regular card, make your birthday party, Thanksgiving party unique and impressive with a personal touch greeting or invitation photo card. Base price is priced by set. Each set of the 5" x 7" cards is 16 cards in total. Base price is priced by set. Each set of the 4" x 8" cards is 12 cards in total. Personalized Notebook A personalized photo notebook is something you can never get anywhere else. Create a customized color cover for the spiral notebook. You can use it for any purpose, or your child can use it for writing and drawing, any way they prefer too. They will be proud of a unique notebook that features their photos on the cover. 150 blank sheets (60# white paper) for the inside pages. Spiral binding on the left. Personalized Notepad Show your style and your taste with a customized design on the notepad. Add photo or caption to dress up your design, your personalized layout will be printed on every page for this notepad. 50 pages with custom full color designs on every page (60# paper). Glue padding on the top. Personalized Poster Light up your room with a star-looking poster! Add your photos, captions onto the page, select our professional background designs to make the poster eye-catching. You can simply use it as a special birthday gift or holiday gift! Make the person you love and care as a super star with a personalized poster designed by yourself! Or, simply give yourself a treat with this unique wall poster! Personalized Photo Calendar A personalized photo calendar is a perfect gift all year long. Create one at any time, start from any month, your choice! 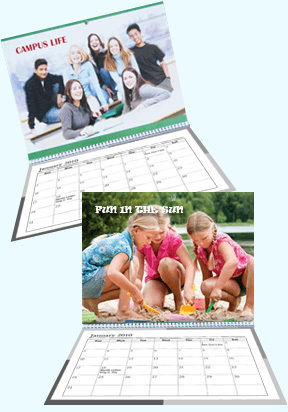 Add photos and caption for each page, we will have a professionally bound calendar shipped to you in just days. Custom full color cover, printed on heavy cover stock for each calendar page. Starts from any month and ends at any month. Either white or select from hundreds of background designs. Your own photo pages will be printed on the top, and the black and white calendar pages with your preselected styles will be printed at the bottom.